The experiences, thoughts, advice, lesson ideas, resources, and general ramblings of a high school history teacher. The beginning of a new school year is exciting, but it can be a tough time for everyone. Students, teachers, parents, and many other people must adjust to new routines, new social situations, new expectations, new learning, and a general upheaval in daily life. I think most of us feel a certain level of anxiety as we adjust to these changes, but there are things educators can do to ease the transition back to school. September - Back to Work - Back to School - Back to BOOKS. 1940. 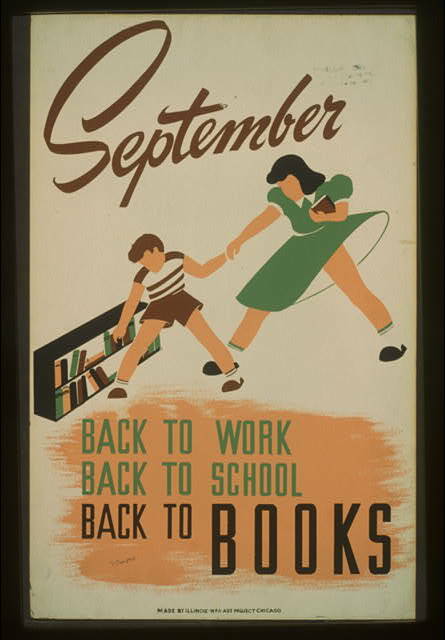 Work Projects Administration Poster Collection (Library of Congress), Library of Congress Prints and Photographs Division, Washington, D.C. In September - Back to Work - Back to School - Back to BOOKS. Accessed August 25, 2016. http://www.loc.gov/pictures/resource/cph.3f05218/. We’ve all heard the importance of establishing rules and routines early in the year. Teacher prep programs often stress this and some of us were even given the advice to not smile until Thanksgiving. I understand the thinking behind these philosophies (well, maybe not the one about not smiling). It is difficult to regain control of a classroom once it’s lost and one of the biggest fears of new and veteran teachers alike is losing control of their classroom. This thinking leads many teachers to feel they have to immediately establish rules, expectations, and most importantly discipline in order to maintain an effective learning environment and to become a master of classroom management. Unfortunately, the unintended consequence of this is establishing a very unwelcoming atmosphere for students. For many students, the beginning of the year is filled with “Do this” and “Don’t do that,” all while sitting still and listening for extended periods of time. I am not trying to downplay the importance of rules and expectations, but we need to put ourselves in the shoes of our students. How many students—already nervous, unsure, and anxious about the transition from summer to a new school year—go through an eight period day and feel like they are being threatened and intimidated eight times? The first day of school tends to be the same in most classes. Students come in, find a predetermined seating chart (usually alphabetical), go through roll call (possibly enduring eight different mispronunciations of their name), listen to rules, go through the syllabus, and maybe—if there’s time—some sort of ice breaker or “what I did this summer” activity. Imagine how we, as adults, would react to this. If we had to endure someone seemingly trying to establish an authoritarian environment where we appear to have no voice while talking at us for 40-60 minutes before releasing us to another individual who does the same thing, then most of us would not go back for day two. Smith, Jessie Willcox. Back to School Again. C. 1928. Louisa Du Pont Copeland Memorial Fund, Delaware Art Museum. In Rockwell Center for American Visual Studies. 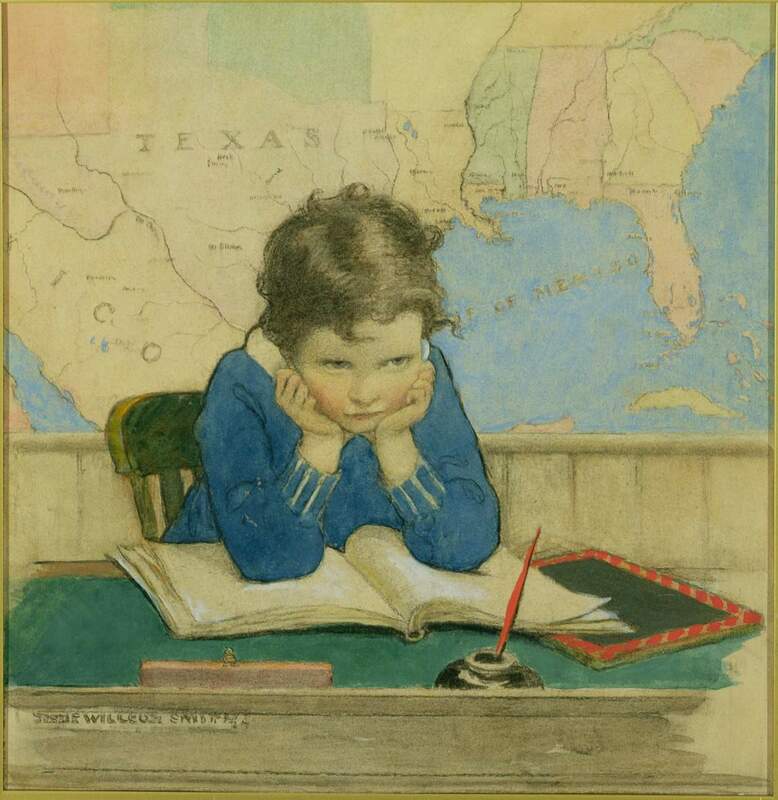 Accessed August 25, 2016. http://www.rockwell-center.org/portfolio-items/smith-back-to-school-again/. As if this doesn’t already establish an uninviting environment, compare it to a student’s summer experiences and it’s no wonder many kids dread back-to-school time. I understand that not everyone has this experience at school and that summer can be a difficult time for many children, but we, as educators, need to be more conscious of how we welcome students into our classes. I often try to relate school experiences to what I see, or hope to see, for my own children. Looking back over the last few weeks of summer, my kids did a lot and learned a lot. We went to the State Fair where they learned about animals; experienced history in a one-room schoolhouse; walked through a trapper’s rendezvous and other historic demonstrations/displays; and explored exhibits and projects created by youth from around the state. We spent time at the lake swimming, canoeing, fishing, hiking, riding bikes, and learning to kayak and paddleboard. 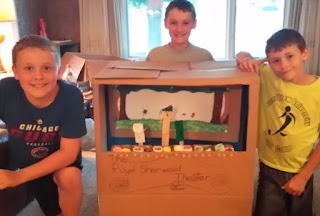 They created a cardboard puppet theater, puppets, and scripts for several performances. They built cardboard arcade games (inspired by Caine’s Arcade). And began working to earn badges on DIY.org. I know not all students have these types of experiences in summer, but many kids experience an amount of self-direction and freedom that results in a type of learning that is very different from school. Many of these kids are excited, nervous, and hopeful as they head back to school, but they are greeted with the experiences I described above and then asked to read the textbook and told how much homework they will have this year. So, what can we as educators do about this? We still need to establish rules, procedures, and routines. We want students to know what we will study, how our class will be structured, and what our expectations are for them. I am certainly no expert and I definitely do not have all of the answers, but I think it is important that we recognize we do not have to do all of these things the first day. I think it is important that we establish a welcoming environment that helps ease student anxiety and provides an introduction to the year. I have experimented with different ways to open the school year, some of which I liked better than others, but I tried to make a point of allowing students to be involved (as opposed to passively listening to me go over rules, etc. ), getting them moving (we can’t expect them to sit quietly in every class after moving on their own terms over the summer), providing a brief introduction of myself and my class, and helping them to get to know each other. Sometimes I included a brief intro to my expectations, but I often found that it worked better to teach expectations and procedures as situations arose over the first few weeks as opposed to laying out a long list of rules the first day. Recently I’ve run across a few different articles that reinforce my beliefs about the beginning of school and/or offer advice to establish a welcoming environment. George Couros posted 10 Easy Ways To Create an Amazing #ClassroomCulture This Year. These are tips that can be used throughout the year to make a difference in classroom environments. As George says, “Every year we should strive to make it the best year students have, and if we all did this, school would only progressively get better for our students.” Although What If High School Were More Like Kindergarten? does not focus directly on the beginning of the year, it does include ideas that impact classroom culture and it reinforces my thoughts that we need to allow everyone, regardless of age, the chance to be a kid once in a while. Along these same lines, I was alarmed, although not overly surprised, when I recently ran across The Decline of Play and Rise in Children's Mental Disorders. As I was going through the final editing of this post, I came across an article from The Atlantic that describes common back-to-school procedures in Finland. The ideas discussed in How Finland Starts the School Year are very similar to many of the thoughts I've discussed in this post and this article is definitely worth a read. Lastly, I saw a tweet this morning from Nathan Wear, High School Principal in Solon, Iowa, that illustrates students' feelings about school. I love the idea of asking students what they want and responses from students at Solon High School seem to reaffirm many of my thoughts about how we should be approaching school. There is no one right answer for how to begin the school year. Everyone’s unique situation and personality dictates how they can effectively welcome students to class. I’ve included a brief description of some of the different activities I have tried over the first few days below. Rather than assigning a seating chart, I have students pick the name of a U.S. President out of a hat. Students then read a brief (< 1 page) summary of the president focusing on things that are significant or unique about this President as a person or about their time in office. Students must then find the desk with a statement taped to it that describes the president they read about (I tape these on the desks before class starts). Each student then introduces himself or herself and tells the class one interesting thing about the president they read about. This provides us with a seating chart (that’s not alphabetical), gets students moving, introduces topics we will study, and allows students to introduce themselves to the class in a non-threatening manner. Who Am I? -- Introducing the Teacher through Primary Sources. This activity provides students a chance to work together and get to know me while introducing primary sources. It also helps us get to know each other as students determine what sources describe them. I have used excerpts from Stupid History: Tales of Stupidity, Strangeness, and Mythconceptions Throughout the Ages by Leland Gregory as a way to get students interested in history. Students can also share summaries of these stories with small groups or the whole class as a way to introduce themselves. I have used parts of TCI’s Getting Started and Getting to Know Each Other lesson. This helps introduce classroom expectations while allowing students to work together and analyze images. We’ve compared The True Story of the Three Little Pigs by Jon Scieszka to the traditional tale of The Three Little Pigs as a way to illustrate the importance of perspective and multiple points of view. I use this to introduce the idea that as we read a number of primary and secondary sources throughout the year it is important to keep in mind that different people may interpret the same event in different ways. It can be valuable for historians to look at these differences, but it is important to recognize that a single interpretation of the past is not always as valuable as examining multiple interpretations. This provides a fun activity that allows students to interact with each other and to think about children’s stories. I’ve used variations of the What is History and Why Do We Study It? lesson plan, particularly the portion on quotations. This helps establish some rationale for why it is important to study history while allowing students to develop their own thoughts on the topic. I like to have students do this in small groups so they get used to working with each other. Students describe their expectations for the year on Padlet. This provides student voice and allows us to discuss what students hope my class will be like. I have also used several versions of “Find Someone Who . . .” sheets or bingo sheets (get a bingo by finding someone who . . .) as a way to get students moving and getting to know each other. I think the most important things we can do are to have fun with our students and to always keep in mind what is best for them. I know we all intend to do this, but as we begin planning for everything we need to fit in and how we can make things run smoothly, sometimes we veer a little off course. So we all need to make a conscious effort to put the best interests of students first all year long. After 15 years as a high school history & social studies teacher in Omaha, NE, I am now transitioning to a new position as an Instructional Technology Consultant in central Iowa. I plan to continue this blog as a mixture of history/social studies content and educational technology tips, hints, and ideas. My teaching experience includes many different levels of history classes (credit recovery, academic, honors, and AP) in various settings (traditional, blended, and online). I am also experienced in curriculum development for online and traditional classes. I strive to develop student-centered, inquiry-based lessons and curriculum that emphasize the importance of student analysis and critical thinking. I am also a big believer in the effective integration of educational technology. My new position affords me more opportunities to explore the field of educational technology and my future posts will most likely include a mixture of history, technology, and general education-related content.